How can you see the atmosphere? The answer is blowing in the wind. Tiny particles, known as aerosols, are carried by winds around the globe. 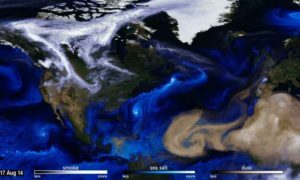 This visualization uses data from NASA satellites combined with our knowledge of physics and meteorology to track three aerosols: dust, smoke, and sea salt. Sea salt, shown here in blue, is picked up by winds passing over the ocean. As tropical storms and hurricanes form, the salt particles are concentrated into the spiraling shape we all recognize. With their movements, we can follow the formation of Hurricane Irma and see the dust from the Sahara, shown in tan, get washed out of the storm center by the rain. Advances in computing speed allow scientists to include more details of these physical processes in their simulations of how the aerosols interact with the storm systems. The increased resolution of the computer simulation is apparent in fine details like the hurricane bands spiraling counter-clockwise. Computer simulations let us see how different processes fit together and evolve as a system. By using mathematical models to represent nature we can separate the system into component parts and better understand the underlying physics of each. Today’s research improves next year’s weather forecasting ability. Hurricane Ophelia was very unusual. It headed northeast, pulling in Saharan dust and smoke from wildfires in Portugal, carrying both to Ireland and the UK. This aerosol interaction was very different from other storms of the season. As computing speed continues to increase, scientists will be able to bring more scientific details into the simulations, giving us a deeper understanding of our home planet. Visit the site to view a great video of this. Even though satellites can detect dust in the atmosphere does not mean it’s easy for scientists to detect it in satellite imagery. It might seem small, but atmospheric dust is a big deal. Consisting (mostly) of tiny pieces of metal oxides, clays and carbonates, dust is the single largest component of the aerosols in Earth’s atmosphere, and it likely has a significant impact on the Earth’s climate, as it effects a wide range of phenomena, including from temperatures in the Atlantic Ocean to the rate of snowmelt in the southwestern U.S. Dust may also affect hurricanes, as recent research based on data sets dating back to the 1950s suggests an inverse relationship between dust in the tropical North Atlantic and the number of Atlantic hurricanes during the past several decades. Yet, while its impact on Earth’s ecosystems is easy to detect, its presence in satellite imagery may not be. If you’re wondering how a satellite travelling 22,236 (or 512) miles above the Earth’s surface can even detect something as small as dust in the first place, it’s because dust, like other aerosols in the atmosphere, reflects or absorbs light. Satellite sensors, such as the GOES I-M Imager aboard the GOES-13 and -15 satellites, the Advanced Very High Resolution Radiometer (AVHRR) aboard the NOAA-series satellites, and the Visible Infrared Imager Radiometer Suite (VIIRS) aboard Suomi NPP, can detect these areas of reflection and absorption, thus indicating varying amount of aerosol in the atmosphere. Improving our ability to detect dust in the atmosphere is beneficial because just how much dust enters the atmosphere each year is unclear – projections range from 200 to 5,000 teragrams a year (a teragram, Tg, equals one trillion grams). Scientists estimate that, on average, about 20 Tg of dust are suspended in the atmosphere at any given time, but seasonal variability is common. Inter-annual variability is also a factor, as ocean-related weather phenomena such as the North Atlantic Oscillation and El Niño have been associated with greater Saharan dust transport across the Atlantic. And speaking of the Sahara, Lake Chad, which sits just below it in the north-central part of Africa, is the Earth’s largest single source of atmospheric dust. In fact, about half of the dust suspended in Earth’s atmosphere originates in North Africa, due to both the abundance of dust sources there and the region’s position under the subtropical jet stream, which carries dust around the world. The rest is said to come from just a handful of other well-known dust-producing regions, including northwestern China’s Taklimakan Desert, parts of Arabia, Iran, the shore of the Caspian Sea, the Lake Eyre Basin in Australia, and the area around Utah’s Great Salt Lake.